As I was reviewing some of my past posts, I realized that I have never shared with you my favorite Hebrew word: Shalom. Such a simple word with so much meaning. Shalom is the peace this world is desperate for; Shalom is what this world has not experienced—particularly not this past year. As I write this, Putin is assuring Assad of his help; a man is holding hostages in the Ukraine; Israelis are wondering if Gaza will send more missiles our way tonight, like they did last night; and Iran is a nation in crisis. 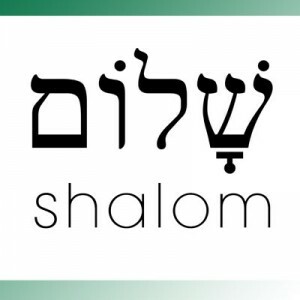 As we prepare for a New Year, perhaps a closer look at this wonderful word, shalom, is just what we all need. Words in Hebrew usually are comprised of a three letter “root.” Many times the root of one word is the root of another word, allowing us to find connections between words, and adding special nuances to all the meaning of all the related words. Try pronouncing these words. You can hear the similarities between them. As you can see by the related meanings of words using the same root, shalom actually has very little to do with a warless state. Rather, this peace reflects completeness, wholeness, and harmony. There is no sense of division. If you were to look up all the ways that shalom is used in the Tenach, you might be rather surprised. We find the above words in surprising places in the Bible, from references to the whole uncut stones of the alter (Deut. 27:6) to the blessing of Boaz to Ruth, that she might be rewarded by the Lord (Ruth 2:12)—he is literally praying for God to pay her back for the good she has done. In Isaiah, shalom relates to peace with the God of Israel, personal peace, peace between each other and nations, and even to the conditions of nature. Thou will keep him in perfect peace [shalom shalom], whose mind is stayed on Thee, because he trusteth in Thee. As you see, in Hebrew, the word shalom appears twice in this verse—hence the interpretation “perfect peace.” This is a peace that is far beyond the absence of war. It is a completeness and wholeness before the God of Israel. But think about this. In order to have this kind of perfect peace, we need to have our minds completely focused on Him, and we need to trust Him. We long for perfect peace in a world that is willing to settle for peace at any cost. People and nations either avoid conflict or rush into it. Avoiding conflict leads to a false peace, but when nations rush into conflict the results are disastrous. World War I the nations rushed into conflict, and World War II they thought they could avoid conflict. But the result of both reactions was not peace but war. So when you think about it, peace is not the absence of conflict! We think how wonderful that is, but what kind of peace did they mean? When Mary and Joseph dedicated Jesus in the temple, Simon, a righteous and devout man, who was looking for the consolation of Israel—the Messiah, would prophesy that a sword would pierce Mary’s heart because of her child (Luke 2:34). Clearly, sorrow and suffering would come. Is it possible to have peace at the same time that we are experiencing sorrow and suffering? There is nothing in these words that declares an absence of war, conflict, sorrow, or suffering. These are all part of a sinful world. Rather, the peace that comes from God, the marvelous Shalom of God speaks of being whole in Him, being complete in Him, being paid for (by Him?! ), and of something that is perfect. In Hebrew, the process of making peace involves making one whole and complete. Well you can’t do that if you are at odds with someone. Someone has to make a step towards wholeness or peace cannot be achieved. So at the heart of Biblical peace, is relationship. Without a relationship, you can’t have peace. I’ve often shared with you that my faith is not about religion (Christianity) but about a relationship (with the Creator of the Universe). This is the shalom that we all need as we enter the New Year. Peace with God that is strong enough to carry us through all that lies ahead. Jesus came to make peace between man and God, to be our peace. When I know my sins are forgiven, my conscience is at peace. When I know God truly loves me, no amount of sorrow or suffering can rob me of my peace. I remember so clearly the sorrow I felt when my husband, Rich died. Yet at the core of my being there was something that held me—shalom—peace from God. Yes, I would be sad; yes I would miss Rich; yes this hurt; yet I knew a peace that carried me through it all, and still is with me to this day. I remember the two wars that impacted my life here in Israel. I remember looking out my window and seeing missiles landing in a distant field. I recall laying in bed as my room shook from an explosion overhead, and crying to God. And I remember His peace that was with me—I was in His hands. This is all that Jesus did and more when He died on the cross and was raised up three days later. Jesus makes peace between us and God; He is our peace. As you say farewell to 2017 and prepare to enter 2018, I hope you’ll find time to ponder the wonder of God incarnate. He was born for you and for me and for every person that has ever and will ever exist. He offers us perfect peace—shalom shalom. Oh boy, are we waiting for peace. His peace. Which, as you stated, can only be through Him, who is the Author (establisher) and finisher (perfecter, completer) of our faith. Thank YOU Peg. I always appreciate your encouraging words. A couple of other people wrote letters to me that they also liked this post. Oh how I long for REAL shalom in this world! Joyous New Year to you too. I love this post, Dvora! Thank you so much for an in-depth study into this very special Hebrew word. I’ve taken the liberty of sharing the link to our Writers4Christ loop … if it goes through. Thanks, again, and my you have a Happy, and SHALOM New Year.